We’ve always been obsessed with gemstones, learning from an early age that “diamonds are for ever” and admiring family heirlooms which have been passed on through the generations. Victorians coveted semi-precious stones, which were seen as symbols of prestige and museum collections contain vast numbers of rough and uncut examples. Gems feature as an integral part of our history. Egyptian pharaohs treasured turquoise and lapis lazuli, which has also been mined in Afghanistan for over 7,000 years. The richest families of ancient China collected jade, whereas in other parts of south-east Asia and India, wealth was demonstrated by ownership of the rubies, emeralds, and sapphires. Nowadays whilst we are increasingly technology-obsessed, we continue to search for ways to feel connected with nature. Semi-precious stones provide us with this opportunity with no need to step out from our urban homes. Artists like Berin-based Lukas Wegwerth are embracing this desire by playing innovatively with the process of crystallisation, growing crystal formations into the cracks of broken ceramics. His creations look alive, weird and brilliant at the same time. The kind of feature which will draw gasps from dinner party guests and be the talk of the town afterwards. The allure of semi-precious stones never fades. Some manufacturers are now tempting us by using them in furniture, accessories and wall design, creating show stopping splendour in our homes. Payanini, a prominent stone supplying company is writing a new page in history. They search out the most perfect and pure examples from the world’s most far flung quarries, distinguishing by colour vibrancy, transparency and optical properties. Each type of stone has unique characteristics requiring specific applications, cuts and manufacturing operations. Only then can the material’s aesthetic properties be displayed and appreciated fully. Some semi-precious stones such as Amethyst and Tiger Eyes are widely known. Amethyst has an elegant blend of deep purple and violet hues, stimulating curiosity and imagination. Mined in South America and Africa, it has been extremely popular throughout the course of history. Amethyst belongs to the quartz crystal family and the stunning mineral is most commonly formed by a hydrothermal process, from silicic acid solution with a low iron concentration that collects in the cavities created by gaseous vapours of volcanic magma. Originally considered as being one of the five most precious stones in the world, it is now found in the prestigious interiors, traditional and modern alike. Tiger Eyes is another all-time favourite due to its unique gold and brown colours intertwined in a bold pattern. This semi-precious stone is derived from Hawk’s Eye, forming as a result of the oxidisation of crocidolite fibres and to their transformation in limonite, to produce a variety of quartz. The physical properties of these gemstones enable backlighting to create a dramatic appearance with stunning visual effects. Antolini, Italian manufacturer is taking this a step further, having developed a way of introducing silver, gold and Swarovski crystals into these stones, making them totally magnificent. The Precious Swarovski Collection uses painstaking craftsmanship to add pure glamour to some of nature’s most beautiful stones. But stone is not the only luxury material used in interiors. There is no other material like mother of pearl. This is an organic gem formed from the protective layer of calcium carbonate which builds up and lines the inside of the pearl oyster shell, the same natural process and material as the pearl itself, and takes up to seven years to develop fully. Some specimens have opal-like colours which create an extra, third dimension to the material. The rich iridescent sheen comes from light reflecting off the many orientated microscopic slabs of aragonite, bound together by a special protein. A kaleidoscope of colours, reflections and fluidity of light evokes memories of the sea. Mother of pearl can be used in many products, including tiles and wall coverings and is increasingly more accessible with prices reflecting increased availability from new sources. 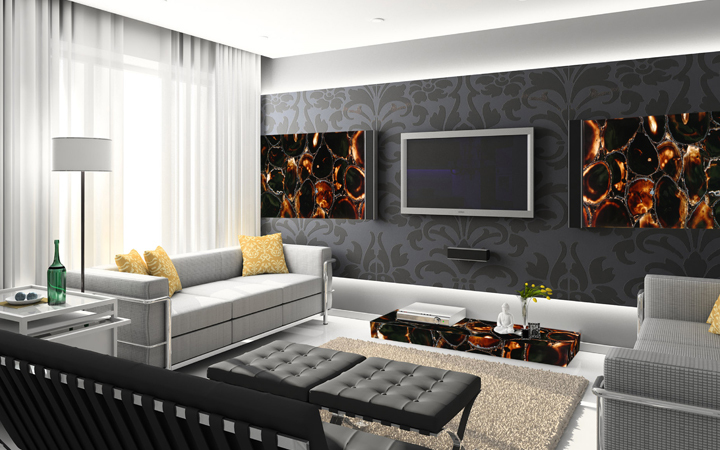 The accessibility of precious stones for use in interiors is increasing. Venusrox is a London-based shop that sells crystals in both rough and polished forms or made in to jewellery. A more interior-design orientated shop is Dale Rogers Ammonite, which sells gem stones made in to free standing sculptural pieces, wall hanging objet d’art or pieces of furniture. You can start your collection with a small piece of nature’s creativity or go big, having a whole feature wall clad in semi-precious stone. Whichever choice you make, this will be a worthy contribution to your interior and will provide enjoyment for years to come. As an alternative, if actual stone isn’t for you, you can follow the trend with Cole & Son’s Fornasetti Malachite wallpaper, Today Interiors’ marble wallpaper designs in gold and pewter colours or Zinc’s fabrics printed with amethyst patterns, which are suitable for upholstery or curtains. There is now a product to suit every taste and budget.